The hardscape aspect of a new landscape design can offer an exciting challenge. A well-designed hardscape, like a patio or an outdoor kitchen, will fit naturally into its surrounding environment. This will take some advanced planning. It should provide a focal point on which the eye can rest for a visual sense of stability. You also need to consider how it will impact the property as a whole and avoid creating drainage issues or blocking natural walkways. After the structural planning is complete, the fun begins. On to your design choices! When it comes to choosing the best type of paver for a patio in Roswell, you’ll want to consider both budget and aesthetics. We’ve created this simple guide to your best paver options. Brick creates a traditional look and blends well with the environment. 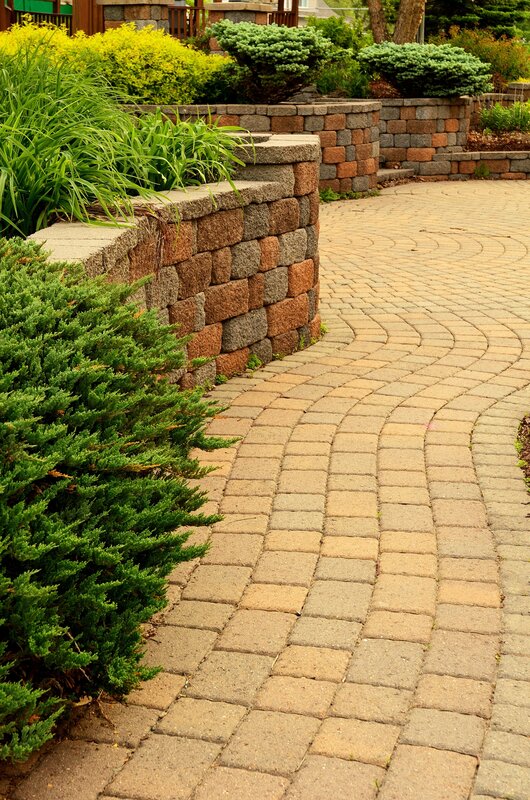 Brick pavers come in many shapes, not just the traditional rectangle, and can be used to create a variety of patterns. Concrete offers versatility because of the many ways you can texture and enhance the surface. Concrete pavers can be stamped, engraved, or stenciled for a unique look. The style and color options for these pavers seem endless. Rubber tile pavers are an interesting option. Made from recycled tires, they mimic the look of concrete but are lightweight. They create the best option for slip resistance, and many go this route because of the environmental benefit of reuse. This is another versatile material that works both indoors and out. These stone pavers are a classic, timeless choice. They come in pre-cut shapes or uncut, rough shapes. These pavers rest in sand and form a sturdy, well-drained, and water-resistant surface. The dark color of a patio made of slate or flagstone creates an elegant, traditional look. Granite is often the patio paver of choice for landscaping contractors. It offers a slip-resistant and extremely durable surface, and works equally well around fire-pits and pools or ponds. When it comes to choosing the optimal material for your patio pavers. consider the overall fit within the landscape, wear and tear, and the maintenance costs you’re willing to put into the project.